Beware the Man of the Year. You may praise him, resent him, even want to be him: but beneath the elegant trappings that define him, danger looms. Caroline Louise Walker’s stunning debut novel, for fans of Herman Koch’s The Dinner and Shari Lapena’s The Couple Next Door, delves into the increasingly paranoid mind of a man whose life as the most upstanding of citizens hides a relentlessly dark heart. Dr. Robert Hart, Sag Harbor’s just-named Man of the Year, is the envy of his friends and neighbors. His medical practice is thriving. He has a beautiful old house and a beautiful new wife and a beautiful boat docked in the village marina. Even his wayward son, Jonah, is back on track, doing well at school, finally worthy of his father’s attentions. So when Jonah’s troubled college roommate, Nick, needs a place to stay for the summer, Hart and his wife generously offer him their guest house. A win-win: Jonah will have someone to hang with, and his father can bask in the warm glow of his own generosity. But when he begins to notice his new houseguest getting a little too close to his wife, the good doctor’s veneer begins to crack. All the little lies Robert tells—harmless falsehoods meant to protect everything he holds dear—begin to mount. Before long, he’s embroiled in a desperate downward spiral, destroying the lives that stand in his way. It’s only the women in his life—his devoted office manager, his friends, his wife—who can clearly see the truth. Biting and timely, Man of the Year races along at an electric pace, with a wicked twist that you won’t see coming. This readers group guide for Man of the Year includes an introduction, discussion questions, and ideas for enhancing your book club. The suggested questions are intended to help your reading group find new and interesting angles and topics for your discussion. We hope that these ideas will enrich your conversation and increase your enjoyment of the book. Dr. Robert Hart, Sag Harbor’s just-named Man of the Year, is the envy of his friends and neighbors. His medical practice is thriving. He has a beautiful old house and a beautiful new wife and a beautiful boat docked in the village marina. Even his wayward son, Jonah, is back on track, doing well at school, finally worthy of his father’s attentions. So when Jonah’s troubled college roommate, Nick, needs a place to stay for the summer, Hart and his wife generously offer him their guesthouse. A win-win: Jonah will have someone to hang with, and his father can bask in the warm glow of his own generosity. 1. The novel opens with Robert, Elizabeth, and Jonah suffering through a photo shoot at the Citizen of the Year event. Does this initial introduction to Dr. Hart and his family seem like a metaphor for the picture-perfect façade Dr. Hart wishes to present? Discuss how Nick’s inclusion in the final photo symbolizes a disruption in their family dynamic. 2. Recall Robert’s reaction when he sees the family photo in print—both in the newspaper (p. 59) and in the proofs mailed to him toward the end of the book (p. 262). How does his perception of the very same image change as his fears, assumptions, and misconceptions change? What are some other ways in which people see things differently based on their own life experiences and access to information? 3. Discuss Jonah and Robert’s relationship. Is the angst in their father-son dynamic understandable, or does the tension between them seem extraordinarily fraught? Consider in your response Jonah’s remark at the end of Chapter 2 that his father “just isn’t my people” (p. 22). 4. Children—the choice of whether to have kids, the manifestation of love for them, a parent’s responsibility to his or her own, the commitment to childhood friends, a community’s treatment of children, and the intergenerational patterns that either break or repeat—are central themes in the novel. Discuss the many ways in which this theme is explored in Man of the Year. You might consider Raymond and Robert, Kayla, Elizabeth, Jonah, and Nick in your response. 5. In countless ways throughout the novel, Robert claims to have Elizabeth’s best interest at heart, like when he urges her to join the local women’s book club or prods her into hosting a party to honor Nick’s memory. On page 86, Robert says he just wants them to be happy and that it gives him “great pleasure to watch her mull over the possibilities of an idea she now thinks was her own.” Do you think Robert’s desire for Elizabeth’s happiness is genuine, or does he misunderstand power for love? Could there be a different motivation driving Robert’s choices? 6. Robert Hart muses to himself during his unnecessary exam on Nick: “In what other work dynamic must one submit to inspection like this? No banker gets to squeeze another man’s neck without resistance. Architects can’t shove objects down throats without arrest. Doctors, however are expected to do as much and more” (p. 103). Discuss Robert’s work and the ways it shapes his worldview and behavior. How can the same framework be applied to other characters and their jobs: for example, Elizabeth seeing the world through a literary lens? 7. “Today I have a choice: love or hate” (p. 125). Robert repeats this to himself as a kind of mantra. Elizabeth muses on the simultaneously touching and nauseating memory of her ex-husband’s poetry written in her honor. And after Nick’s funeral, his aunt, Naomi, admits to herself that she has “no way of trusting whether the thing I call love isn’t hate in disguise” (p. 183). Explore the thin line between love and hate that so many of the characters straddle in Man of the Year. Consider Jonah in your response too, and the complicated relationship he has with Robert. 8. Revisit the scene beginning on page 145 when Robert first discovers Nick’s body. In light of the novel’s ending, what details do you now notice that you might have missed the first time? Compare this to Elizabeth’s recollection of the morning Nick died (pp. 276–280). How is her reaction different from Robert’s? How is it similar? 9. How does Simone work as a foil in Robert’s story? How does she work as a savior? In many ways, she appears to be the foundational glue that holds his fragile narrative together. Do you think Robert might have been investigated by police if not for Simone’s interference with the blood vials and her covering up on his behalf? 10. Jonah’s false confession to his father turns out to be very useful in helping Dr. Hart cover his own tracks. Does Robert’s willingness to help his son ultimately come from love or from selfishness? Is it possible Robert is equally motivated by both? If so, do you think that makes him a relatable character? Why or why not? 11. Power is a central theme in Man of the Year. The shifting of power dynamics—or the threat of such shifts—causes much of the chaos that ensues in the story, such as Nick’s perceived relationship with Elizabeth, and the complex web of lies Jonah tells his father to undermine his stability. Consider other instances in the novel where a power struggle results in problems for the characters. 12. Another recurring theme concerns rules: who makes them, who abides by them, who benefits from them, who disregards them. On page 45, Luna thinks, “I did everything right . . . yet somehow I’m the one who’s being punished.” Simone tells Dr. Hart, “‘I follow the rules. . . I spend my whole life being a nice girl, thinking one of these days I’ll finish first, but where has it gotten me, huh?’” (p. 153). Officer Diaz says, “My whole life, I’m taught that the only way to be taken seriously is to do my job and do it well. So I do that, and I get here, and the rules change” (pp. 160–161). And Nick’s aunt, Naomi, mocks: “Ever since we were little: be good girls, listen to Mother and Daddy, marry nice boys, obey the law. Trust the men in charge for no other reason than because they’re in charge. Trust your parents because they made you” (p. 183). Compare these frustrations to Robert’s approach to rules. Consider the story Emily tells on pages 74–75, about the time Robert broke into his high school, then let an innocent classmate take the fall. Why do you think Robert is spared the angst other characters experience in this regard? How do your answers affect your understanding of Elizabeth’s choices as revealed in her confessional at the end of the book? 13. Man of the Year is mostly Robert’s story told from his point of view, and yet several times throughout the novel we are granted access to the perspectives of those around him. Most notably, the novel does not end in Robert’s voice but in Jonah’s. How does this point to the changes that occur throughout the book? Conversely, note the characters whose perspective we never see. Why do you think the author chose to deny us those characters’ voices? 14. On pages 46–47, Robert watches his wife and son set the table, comparing their behavior to performance art. “There are things we can say without reproach when Nick’s in the room. Other things get cut from the scene.” In many ways, the greatest disruption to the Harts’ family dynamic is the “extra set of eyes” (p. 47). Is it natural for people to alter their behavior when they know they are being observed? In what ways do you edit yourself around friends? Colleagues? Family members? Acquaintances? 15. Given the last line of the book, do you think all of Robert’s secrets are safe? What do you think will happen to the Hart family? 1. Jonah admits to his therapist that the idea to hurt his father came to him when he learned about the life of the famous French author Colette. Read one of Colette’s books—Break of Day, perhaps, or My Mother’s House and Sido—with your book club, just as Elizabeth, Luna, Nick, and Jonah planned to do. Discuss the ways Elizabeth may have seen herself in Colette’s words. What did Elizabeth mean when she said, “The way [Colette] rewrote herself is almost sorcery” (p. 91)? Do you agree with Jonah’s assessment that “the true parts are the most interesting parts, no matter how she edits her story” (p. 290)? 2. In his closing soliloquy, Robert says his actions have all been in service of protecting his family. “In the messes we make, the awakenings, the messes we fix, the lives we choose and the ones we inherit, in the better or worse, the ambiguity and ambivalence, in the things we can never undo and the things undone in effort . . . we are family.” (p. 263). Do you believe Robert succeeded in saving his family? Consider your own family dynamics. Are you dedicated to yours at all costs, like Robert? Or are you afraid of becoming one of your parents, like Jonah? Perhaps you consider your best friends to be family, much like Jonah and Nick, Robert and Ray, or Elizabeth and Shae once did. Share with your book club your feelings about family and friendships over Thai food, drawing upon themes Elizabeth addresses in her monologue at Lemongrass. Your group might share personal anecdotes or partake in a discussion of nature versus nurture over dinner. Talk about being seen as a channel or current rather than a source or charge. 3. On page 286, Elizabeth cites an awareness of Robert looking at her “like Ingrid Bergman in Stromboli. Looking like Ingrid Bergman on Stromboli, for that matter—which is exactly how Luna and Monique see me too, for entirely different reasons.” Host a movie night with your group to watch this classic film, followed by a discussion of the film’s notorious production. Share your thoughts about what Elizabeth may have meant when she talked about how she is seen. 4. Make a playlist of the songs mentioned in this book and host a listening party, taking note of the lyrics. Discuss why you think those songs appear in the story. Caroline Louise Walker grew up in Rock Island, Illinois. For her fiction and nonfiction, she has received fellowships from The MacDowell Colony, The Kerouac Project, and Jentel Arts. She holds an MA from NYU. Man of the Year is her first novel. "This is THAT book. You know the one I'm talking about...the one hidden under your teetering should-read, have-to-read, said-I-would-read-months-ago pile. The one you grab at the end of the day because, damnit, you earned this deliciousness, and it reminds you of why you loved reading in the first place. Not only because it's a blisteringly intelligent, breathtaking debut, drenched with a masterful understanding of human nature, brimming with twists, surprises, suspense and razor sharp language, but because it's witty and hilarious and also - long lost thing - the book is a blast to read: it's fun. So go grab a copy and disappear yourself, I'll understand completely." "Beautifully written and deviously plotted—the very best kind of story. 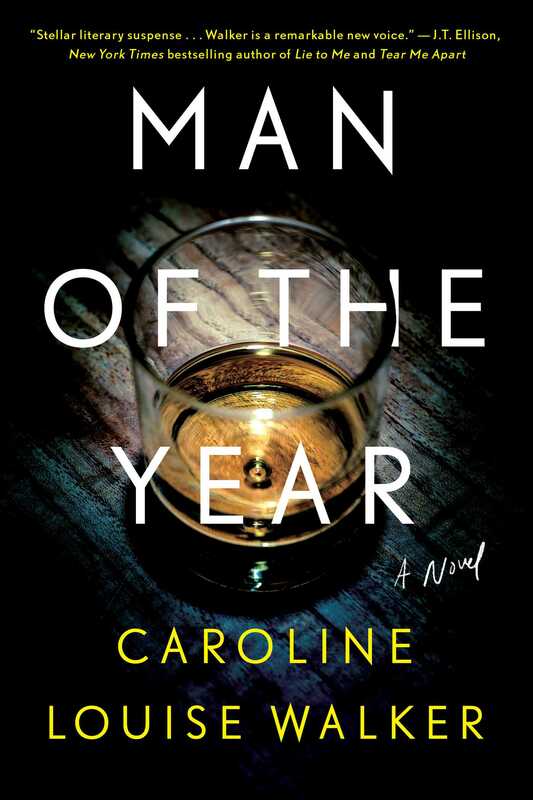 Man of the Year is a stellar literary suspense, exploring the chasm between truth and lies, identity, love, hate, and the pursuit of self, and how a moment’s decision can undo a perfect world. Caroline Louise Walker is a remarkable new voice to watch. Give me more!" "Othello isn’t the only great hero brought low by jealousy, as Caroline Louise Walker’s Man of the Year brilliantly proves. Just when you think you know which of the upstanding doctor’s suspicions to believe, the plot – and human nature – prove you wrong. This is what fiction is for." "Caroline Louise Walker's plot drips out chillingly, slowly, inexorably, until the bitter and savage ending."